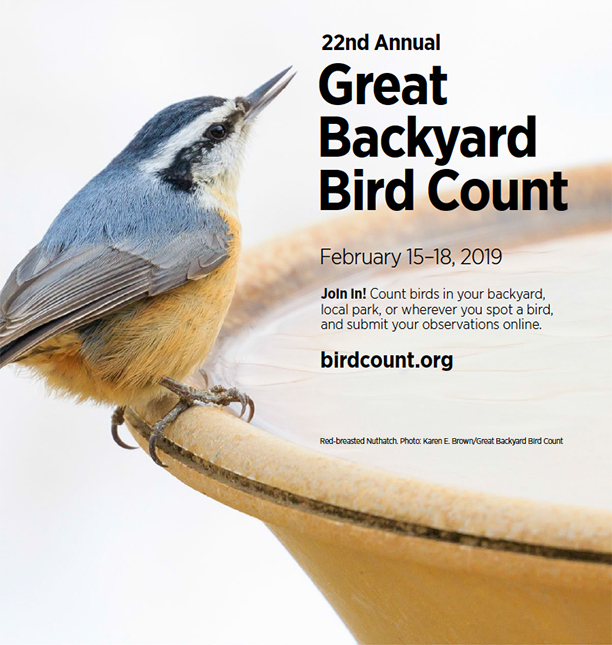 One week from today — February 15-18 — the Great Backyard Bird Count will take a real-time snapshot of birds around the world. You can help. Since 1998 the Great Backyard Bird Count (GBBC) has enlisted volunteers like us to count the birds we see for four days in mid-February. Last year our worldwide effort counted 6,459 species and nearly 29 million birds! Everything you need to know is at birdcount.org including this slideshow that explains how to do it. It’s as easy at 1-2-3. Count birds for at least 15 minutes during the four-day period. You can count in more than one place and longer than 15 mins if you wish. Keep track of the highest number of each species you see with a separate checklist for each new day, for each new location, or for the same location if you counted at a different time of day. Use your computer or the eBird mobile app to submit your observations. If you love to take photographs submit your best shots to the GBBC photo contest. Click here for contest information. You can count birds anywhere — in your backyard, in a park, at the shore, or on a hike. If the weather’s bad, stay indoors and count birds at your feeders. Had forgotten about this..can always ‘count’ on you to remind us of the important stuff…thanks!!! !